Summary: The JTX Tri-Fit is a mid-range elliptical cross trainer with some tricks up it’s sleeve. A major difference between this model and other home cross-trainers is the variable stride length. This makes it perfect for more than one user. The Tri-Fit also comes with incline (great for working on those abs and glutes) and comes with a free Polar chest strap, which works with a smartphone app. This is not a compact unit, though JTX have engineered space-saving arm units into the machine. You can see the full gallery, and check the latest price, over on this dedicated amazon.co.uk product page. 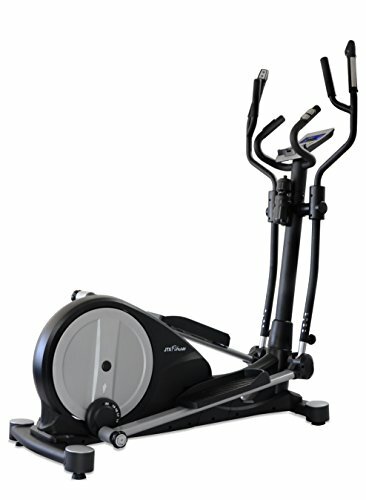 Robust cross trainer with variable stride length system (16- 20"), great for multiple users. Powerful electro-magnetic resistance & incline control. By training on an incline you will engage your core and glutes giving you a more complete full body workout. Combining the incline, resistance and long stride length makes this the ideal cross trainer for weight loss and improving fitness. You’ll get a unit with a patented space-saving design. This is 153cms long, by 75cms wide and 173cms high – still bigger than many budget models out there. It looks professional, with a big flywheel tapering towards the front and a different way of attaching the arm poles compared to many models. The Tri-Fit is finished in classic matte black and silver. Most ellipticals have a fixed stride length. With the JTX Tri-Fit, you’ll be able to adjust this anywhere between 20 inches and 16 inches. This creates the option for comfortable workouts for people of different heights. One comment from a buyer notes that both the buyer (5’6”) and her husband (6’4”) are able to comfortably use this machine. With a 17kg flywheel and magnetic resistance – you’ll get smooth resistance for even the toughest workouts. Outside of commercial gyms, finding a cross trainer with incline is next to impossible. This works in the same way as it does on a treadmill – making your workout more or less intensive depending on how you set it. Adding incline does more than just make your workout higher intensity. This also covers more muscle groups. Your core will get workout with bigger incline, and your glutes too. Note that this is in addition to your other major muscle groups – with both upper and lower body covered. Electronics powering the JTX Tri-Fit match the spec of the body. The console looks great, with 6 buttons in easy reach of the lower (fixed) handlebars. A blue and white screen gives you a readout on all those important measurements – including your heart rate. There are 19 pre-set programs. You don’t have to choose one, this cross trainer can be controlled manually – giving plenty of flexibility for your workout. Along with the machine, you’ll get a polar chest strap. This connects via Bluetooth to a smartphone app called iConsole. This can be downloaded onto both Apple and Android devices. It will give you super-accurate stats and enable you to track your progress as your fitness level improves. JTX are known for their solid support and after-sales service. This was borne out in another comment from a previous buyer. She had an issue more than 2 years after purchasing her machine. JTX sent an engineer out to fix it without delay. This machine comes with a lifetime warranty for the frame and a 2-year home repair warranty covering all the parts, along with an engineer on call-out. I always look for themes running through many of the feedback comments left by previous buyers. One idea which came up repeatedly for the JTX Tri-Fit concerned the engineering. It is easy to claim patented engineering – though when many different buyers compliment this, it can pay to take notice. There is very little negative feedback for this model. Some people had problems with assembly, though this was low even by the standards of fitness equipment. The variable stride-length got some compliments, with several comments saying that it can be used easily by more than one person. Remember to check the feedback for yourself over at amazon.co.uk – this can paint a clearer picture than just the ‘sales pitch’ from the maker. Is the JTX Tri-Fit Elliptical Trainer Right for You? JTX has managed to fit commercial gym style engineering into a compact unit with the Tri-Fit. This is ideal for home use, and great if you plan to share it with anyone of a different height. The incline is a big addition. Not only does this (literally) add a new dimension to the intensity of your workouts – it will reach new muscle groups too. Combine this with the app and polar tracker, and you can watch your fitness level improve in real time. Check out the latest price and comments from buyers on the JTX Tri-Fit dedicated amazon.co.uk product page now!